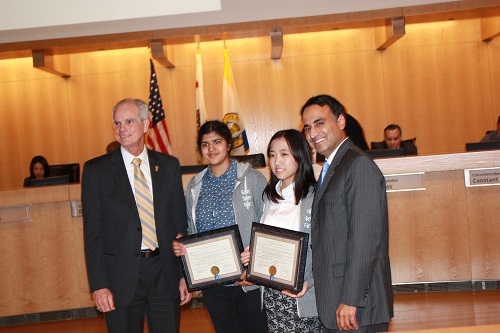 On Oct. 21, Daniela Lee, grade 12, and Sadhika Malladi, grade 11, were honored by San Jose Mayor Chuck Reed and the San Jose City Council with mayoral commendations for their success in the Google Science Fair. The students received the commendations at a meeting of the city council where they met both Mayor Reed and councilmember Ash Kalra. The 2014 Google Science Fair has ended, and senior Daniela Lee and junior Sadhika Malladi have finished as global finalists in the 17-18 age group. Congratulations to these students for reaching this stage of this worldwide competition! Daniela Lee, grade 12, and Sadhika Malladi, grade 11, have been named finalists in the 2014 Google Science Fair in the 17-18 age group! The two entered as a team and their project is up for the Voter’s Choice Award. Voting is open until Sept. 13, so be sure visit the Google Science Fair website to cast your vote! Lee and Malladi also will compete at Google headquarters on Sept. 22 for a grand prize package that includes a National Geographic Expeditions excursion to the Galapagos Islands, a visit to the Virgin Galactic Spaceport and a $50,000 scholarship.